Two Liter Solo w/23″ Ext. The Staking Tool is a 4 Foot Long 3/8″ wide rod which has a pointed tip and “Tee” handle on top. The handle allows for a sure grip so you can push the rod deep into fire ant mounds. 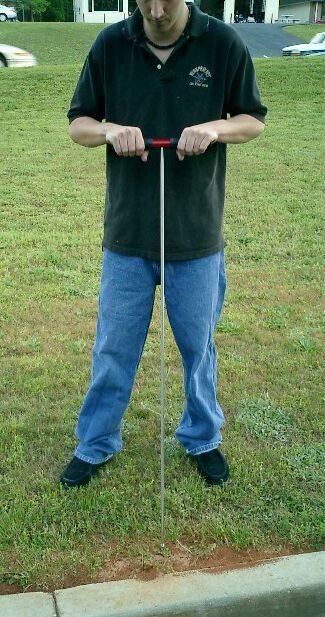 Use this tool for making access holes just prior to drenching a live mound with Cypermethrin or Fire Ant Killing Aerosol. Though the tool is 4 feet long, you only need to penetrate most nests 2-3 feet. The general rule to follow when staking is the deeper the better. However, following a lot of rain, fire ants will tend to be close to the surface so you may only need to go 1 foot down. Also, it is much easier to penetrate ground which is moist so try to time “Staking and Drenching” to just after a rain or irrigation.